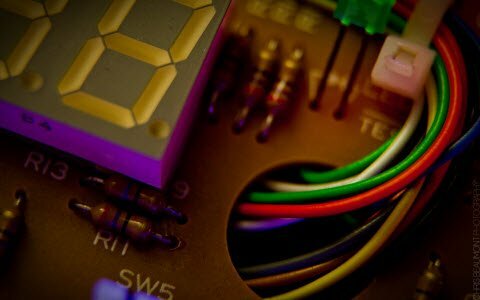 What are the Different Types of Digital Logic Circuits with Working? A digital logic circuit is defined as the one in which voltages are assumed to be having a finite number of distinct value. Types of digital logic circuits are combinational logic circuits and sequential logic circuits. These are the basic circuits used in most of the digital electronic devices like computers, calculators, mobile phones. 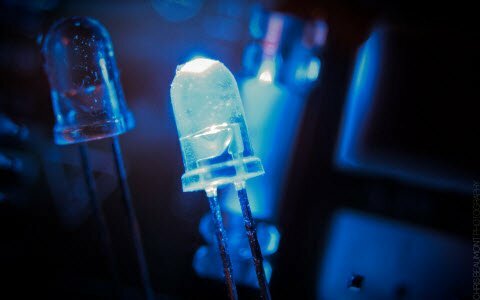 Digital logic circuits are often known as switching circuits, because in digital circuits the voltage levels are assumed to be switched from one value to another value instantaneously. 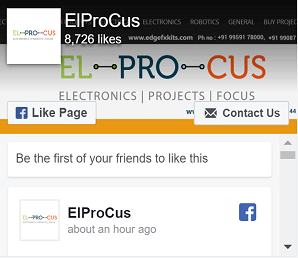 These circuits are termed as logic circuits, as their operation obeys a definite set of logic rules. Combinational digital logic circuits are basically made up of digital logic gates like AND gate, OR gate, NOT gate and universal gates (NAND gate and NOR gate). All these gates are combined together to form a complicated switching circuit. 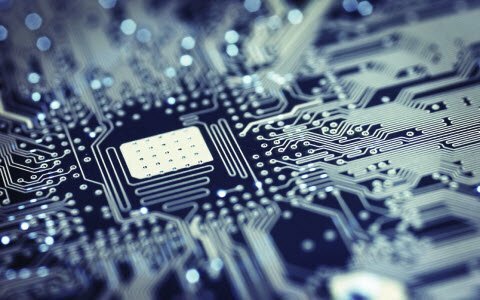 The logic gates are building blocks of combinational logic circuits. 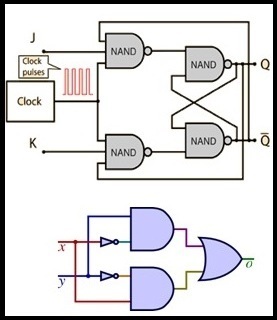 In a combinational logic circuit, the output at any instant of time depends only on present input at that particular instant of time and combinational circuits do not have any memory devices. Encoders and Decoders are examples of combinational circuit. 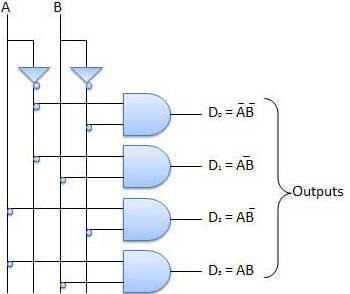 A decoder converts the binary coded data at its present input into a number of different output lines. Other examples of combinational switching circuits are half adder and full adder, encoder, decoder, multiplexer, de-multiplexer, code converter etc. Combinational circuits are used in microprocessor and microcontroller for designing the hardware and software components of a computer. Combinational digital logic circuits are classified into three major parts – arithmetic or logical functions, data transmission and code converter. The following chart will elaborate the further classifications of combinational digital logic circuit. 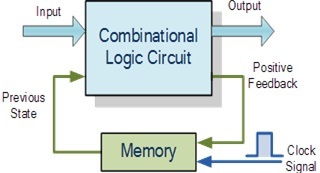 A Sequential digital logic circuit is different from combinational logic circuits. In sequential circuit the output of the logic device is not only dependent on the present inputs to the device, but also on past inputs. In other words output of a sequential logic circuit depends on present input as well as present state of the circuit. Unlike combinational circuits, the sequential circuits have memory devices in order to store the past outputs. In fact sequential digital logic circuits are nothing but combinational circuit with memory.These types of digital logic circuits are designed using finite state machine. 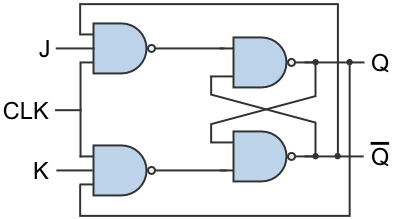 Examples of sequential logic circuits are counters, flip flops, constructed using digital logic gates and memory. 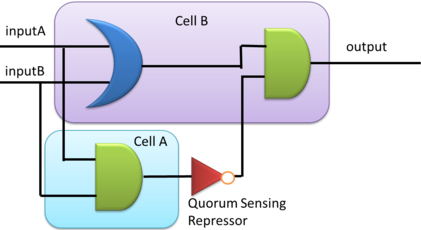 There are two inputs which are operated by combinational logic circuits in order to produce various outputs. The output from the memory devices are fed to the combinational logic circuit. The internal inputs and outputs form part of the secondary devices. Secondary inputs devices are state variables produced by the storage elements, where as secondary outputs devices are excitations for the storage elements. Types of sequential logic circuits Sequential digital circuits are classified into three major parts as Event driven, Clock drive and Pulse driven. These are synchronous digital logic circuit, where the output state transition takes place only when the input signal is applied along with clock pulses. Synchronous sequential circuit uses pulsed or clock inputs. These are asynchronous digital logic circuits, where the output state transition takes place even if we don’t apply the input signal along with the clock pulses. Asynchronous circuit uses pulses of inputs instead of clock signal. Output of sequential circuits can be pulsed output or level output. 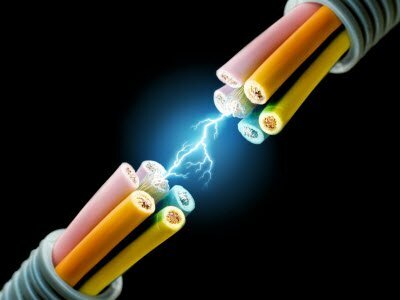 Pulsed output: A pulsed output is an output that lasts for the duration of a particular input pulse but can be less in some cases. For the clocked sequential circuits, the output pulse is of the same duration as that of the clock pulse. Level output: A level output refers to an output that changes state at the start of an input pulse or clock pulse and remains in that state until the next input or clock pulse. 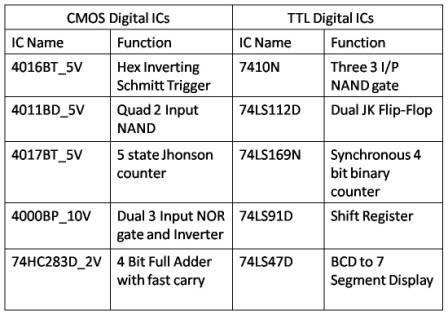 Given below is a tabular form of the summary of CMOS and TTL digital ICs used in most of the digital circuits. 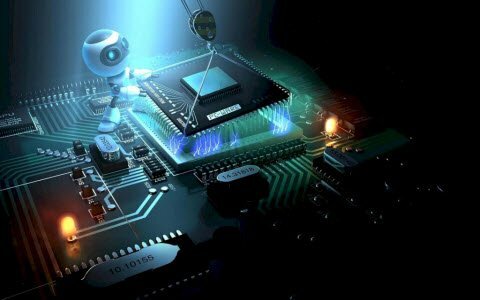 We hope our article has been informative in a simple way and the readers are now able to get a clear understanding of the types of digital logic circuits. Here is a simple question for any interested reader- What are pulse driven sequential logic circuits and give an example. If you have any queries on this topic or on the electrical and electronic projects Kindly give your answers in the comment section below. It is very helpful article for me because it helps to prepare my exam.